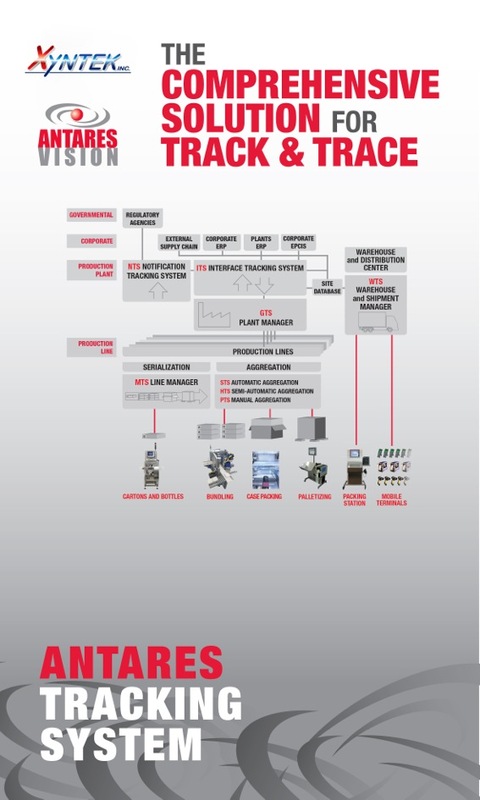 Xyntek, Inc. and Antares Vision Unveil Turnkey Third Generation Pharmaceutical Serialization Solution at Pharma EXPO / PACK EXPO 2014 - Xyntek Inc.
October 2014, Yardley, PA – Xyntek, Inc. and Antares Vision will be unveiling ATS 3.0 in booth W-616 at Pharma EXPO, co-located with PACK EXPO International (Nov. 2 – 5, 2014; McCormick Place, Chicago). Antares Tracking System (ATS) 3.0 is the third generation and the core of the Xyntek-Antares Turnkey Track & Trace Solution. ATS 3.0 is a fully integrated hardware and software platform aimed at serializing pharmaceutical drug packages on the production floor and enabling product tracking and traceability throughout the pharmaceutical drug supply chain. ATS has evolved into a best-in-class and proven solution built around the experiences gained from implementing serialization in over 15 countries, 500 production lines, and serializing over 2 billion product SKUs. The Xyntek-Antares exhibit will showcase the various software modules of ATS 3.0, including the Global Tracking System (GTS) – plant manager, Master Tracking System (MTS) – line manager, and Warehouse Tracking System (WTS) – warehouse/shipping/receiving manager. In addition, Xyntek-Antares will have on display several modules Serialization Work Stations from their wide range of pre-engineered modules including; the Print & Check Advanced carton serialization module, TopView Matrix Case Aggregation Station, SideView Matrix Case Aggregation Station, OmniVision 360 Bottle Tracking Station, and Warehouse Packing Mobile Terminals. These units seamlessly work together to orchestrate an end to end serialized packaging line scenario with aggregation. “Given the current global environment related to drug anti-counterfeiting, brand protection, and the increase of serialization regulations, we anticipate this year’s Pharma EXPO / PACKEXPO conference to be the largest and most attended ever. As such we are making commitments and arrangements at our booth to have a wide array of technology and subject matter expertise on hand to address all of the attendees questions and provide the needed insight to help them plan, select, and deploy the best solution”, says Mac Hashemian, P.E., President & Chief Executive Officer at Xyntek, Inc.
Don’t miss out on this tremendous opportunity to learn more about the latest in global Track & Trace initiatives and technology. The Xyntek and Antares booth will be the place to be this year at Pharma EXPO. As the Exclusive Partner of Antares Vision in North America, Xyntek combines its best-in-class and proven Serialization Solutions Delivery Approach with Antares’ global leading serialization technology to offer the only true end-to-end Turnkey Solution to serve the World’s largest pharmaceutical market: the USA. With nearly 30 years of experience in the Life Sciences industry, Xyntek’s business is based on providing high-end technical services and solutions to maximize the benefits of IT and Automation technologies, while adhering with regulatory mandates. Headquartered in Brescia, Italy, Antares Vision is a leader in offering technology solutions for security and Traceability/e-pedigree to the pharmaceutical industry. Its range spans from Blister filling controls, OCR/OCV readers and verifiers, to leading edge high end controls, such as complete capsule, tablet and vials inspection machines. All products and solutions comply with GAMP5 and 21CFR part 11 directives of the FDA. Customer satisfaction, a global approach to in-line and off-line quality control, creative use of the most innovative technologies in order to supply reliable, long-lasting and user friendly solutions: these are the distinguishing features of Antares Vision technology.